The walk explains the creation of a coherent city block that underpins the 2012 redesign for Leicester Square, its history and the challenges this landmark public space experiences. 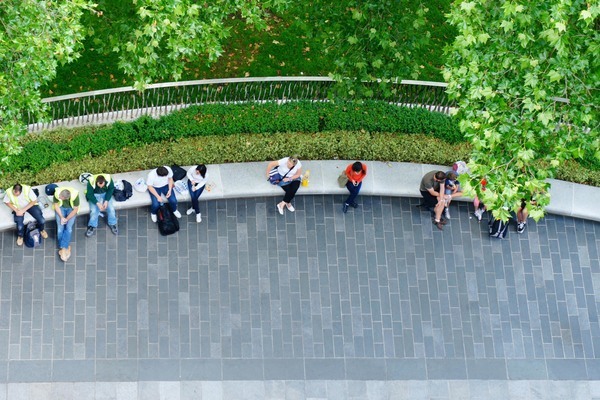 The scheme offered the opportunity to consider Leicester Square: the Gardens, the Square and the Connector Streets as one entity and in so doing create a coherent public realm that has given a new sense of place and the identity to this part of the West End. Leicester Square has been reconnected with its immediate hinterland through an innovative design approach that has introduced a series of ‘routes’ that have given physical and visual cues to encourage pedestrians to enter and move through the space and to appreciate its location with respect to adjacent city destinations. This increase in use by the public during the day and night has given the Square and Gardens a new convivial atmosphere that is inviting and comfortable, which greatly contrasts to its previous character that was unfriendly and at times hostile. The re-design has challenged and disproved that bright lighting makes a space safe and public seating creates the opportunity for anti-social behaviour. The introduction of the Ribbon seat, 200 linear metres of informal seating, is the place changer. Its strong sculptural form is a ‘place’ in itself inviting interaction, defining areas within the Terraces, blurring in or outside the Gardens so making the Square and Gardens one space. The Ribbon draws people to it, it guides people around and through Leicester Square, it is the element that embodies the new design and feel of this urban space. The lighting design, based on tonal palette of white, is innovative in that it is ‘layered lux’ scheme. The Terraces of the Square and Streets are lit from the buildings, the Ribbon is under-lit which highlights its sinuous form. The lighting of the Gardens is provided from bespoke columns which cast pools of light along the paths as well as floodlighting the Shakespeare Statute. The variance of the lighting across the scheme introduces complexity and interest during hours of darkness, that has resulted in a comfortable environment for all users. A clear hierarchy of elements was introduced to unify the square and to define its city block in order to provide legibility and a sense of place. The intrinsic qualities of the London Square have been retained: the London Plane trees, the lawns and the central Shakespeare statue and fountain. The Shakespeare Fountain has been enhanced by the addition of an interactive water feature. The fountain is the focal point of the Gardens and the Square. The design of the ‘White Ribbon’ references the statues white Cararra marble. The 200m long ‘White Ribbon’ acts as an informal seating element that activates the edge of the Gardens and creates a new spatial event. It forms a welcome opportunity to relax and enjoy street life within London’s busy West End. Its form, colour and shape are referencing the Grade II listed Shakespeare statue and fountain. Along the length of the ‘White Ribbon’ seat sits the ‘Green Ribbon’ formed of sweeping lines of textural planting. Together the White and Green Ribbons soften the spatial separation between the Gardens and the Terraces. Their fluid shape unifies the design of the four sides of the square and creates a variety of different seating opportunities. A covenant means that the gardens have to be enclosed by railings. The design addresses this requirement in a contemporary manner. The railings are an important element in re-linking the Gardens to the Square. 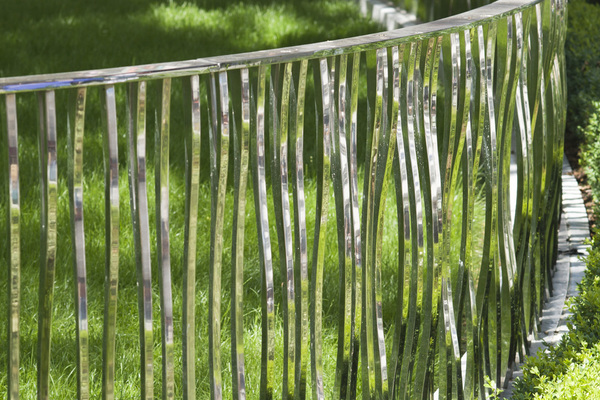 The mirrored stainless steel railings reflect the adjoining planting and the lawn increasing the sense of space both from inside and outside the Gardens. The direction of the vertical uprights creates an ever changing effect when walking along the railings yet maintaining views into the Gardens. Due to its strength and durability the scheme uses natural granite as its base material. Different module sizes and colour mixes reference the specific locations in the scheme and subtly underpin the function of the spaces. Diagonal paving indicate areas of multidirectional pedestrian and vehicular movements; chevron paving patterns are applied to strengthen the effect of the tapering pathways; large radial units create a sense of place in the Central Circle. These differences in detail constitute a family of paving treatments that unifies the appearance of the city quarter.